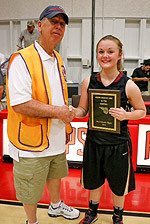 REDDING, Calif. - Athletes from West Valley and Orland high schools took home Most Valuable Player honors after the 19th annual All-Star basketball games on April 6 organized by the Redding Breakfast Lions Club. Kavi Ram from Orland High School and Aubrey Mendonca from West Valley High School were selected MVPs after their performance in the girls’ and boys’ games. Basketball coaches from Simpson University, which hosted the games, selected the MVPs for their outstanding play on offense and defense. The teams—two boys’ and two girls’—comprised 54 high school athletes from throughout far Northern California. Ram played for the Boys South team, which beat Boys North in a close match, 87-84. Mendonca played for Girls South, which won over Girls North, 95-43. Volunteer coaches were Bill Hall from Modoc High School, Curt Eller from Corning High School, Keith Weber from Modoc High, and Todd Dwyer from Redding Christian High School. About 600 people attended the games, whose purpose is “to promote all-star athletics and all-star citizenship through a positive community experience,” said Lions Club member Guy Piche. The Redding Breakfast Lions Club began the tournament in 1996. 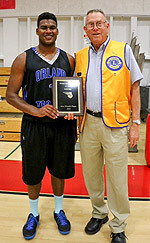 Pictured: Archer Pugh of the Lions Club gives MVP award to All-Star Kavi Ram of Orland High School; Lions Club member Mike Robinson gives MVP award to Aubrey Mendonca of West Valley High School.